Has it ever hap­pened to you that you thought you knew how to fix a prob­lem, done every­thing right on the way, and ended up with a result that is wrong? 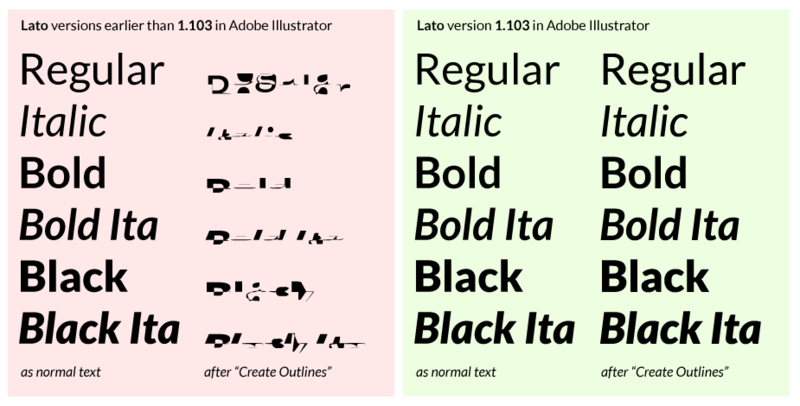 Here’s the thing: when we first pre­pared the Lato fonts for the release on Google Web Fonts in Decem­ber 2010, we used the hint­ing tools avail­able in Font­Lab Stu­dio to fine-​​tune the family’s screen appear­ance. With the mas­sive num­ber of styles avail­able in Lato, and the tight dead­line, we couldn’t do man­ual hint­ing for every glyph, so we ended up doing so-​​called “con­trolled auto­hint­ing”. The results were quite OK, but not amazing. 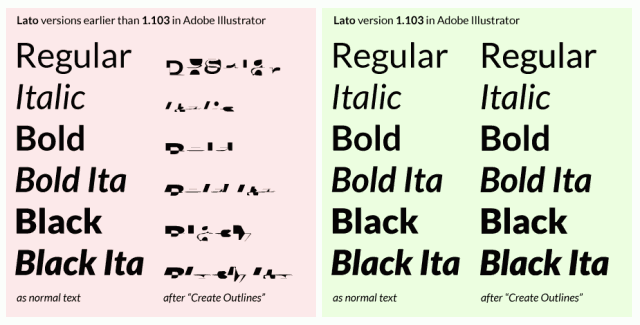 In Sep­tem­ber 2011, we revis­ited the Lato fam­ily: we added the dia­crit­i­cal char­ac­ters for the Pol­ish lan­guage (since both Łukasz and myself are Pol­ish, it seemed odd to release an open­source fam­ily that included char­ac­ters for French or Ger­man but not for our native tongue.) We also wanted to make use of the new ttfau­to­hint library by Werner Lem­berg, which promised very good appear­ance on Win­dows grayscale and ClearType dis­play set­tings. It turned out that indeed — apart from the Hair­line and Light weights — fonts processed with ttfau­to­hint looked bet­ter. So far so good. Ver­sion 1.100 was released. Now — we had a dilemma: fonts made with Font­Lab Stu­dio auto­hint­ing did not look as good on screen, but were very reli­able in desk­top appli­ca­tions, while fonts processed with ttfau­to­hint per­formed poorly in desk­top appli­ca­tions but looked well in web browsers. Of course ttfau­to­hint is a library that’s being actively devel­oped by Werner, and at some point I’m sure the bugs will be ironed out and these prob­lems will no longer occur. But what should we do now? We decided to “split” the release. The fonts intended for peo­ple to down­load and use in desk­top appli­ca­tions were to be FontLab-​​autohinted while the fonts that should be deployed at Google Web Fonts should use ttfau­to­hint. So yes­ter­day, I’ve done all the steps of split­ting the fam­ily and mak­ing two sep­a­rate ver­sions, and released ver­sion 1.102. Great — but there was one thing. What I thought were the FontLab-​​autohinted fonts turned out to be… the ttfautohint-​​processed fonts. Which I then processed again with ttfau­to­hint to make the “real” web ver­sion. So yes: I had two ver­sions, one for “desk­top down­loads” and one for Google Web Fonts, and the process to turn one into another was clean and nice, but in the end, I started off with the wrong data so both ver­sions ended up being the “shreddy” ones. Well — today I real­ized this, so I made sure that what I think I was look­ing at really was what I was look­ing at, and re-​​released the fam­ily as ver­sion 1.103. Which works. So if you’d like to use Lato in desk­top appli­ca­tions, you should go to the Down­load sec­tion and grab the lat­est release. Update: ver­sion 1.104 no longer makes the split nec­es­sary. One and the same font works well on the web and in all desk­top applications!